Well ya already know that I write a column in Laptop Magazine, but now it looks like I made into Engadget this year too. How fitting is this too. I’m a Blackberry lover and it would be only fitting to get capture is a review about that device. 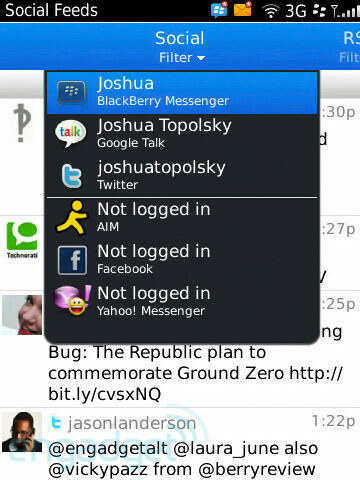 It seems Josh T, while do a review took a screen shot of Blackberry 6 new feature Social Feeds. Social Feeds puts all of your social activities into one place. RSS feeds, Twitter, Facebook, Yahoo Messenger, Window Live Messenger, and I think a couple more. That is me on Twitter letting Laura know she forgot a female in tech when I got capture. Too cool! Ok enough geeking out lol.